I used to like taking the train. My mom and I would take the train from Moscow to Tallinn every summer for our three-month long escape from the city. The cars had sleeper compartments, me taking the bottom bunk and mom the top, and the train only made one stop that I always slept through. Then when I started working full time in the city, I took Metra. I commuted for ten years, I didn’t really mind it. I remember when Metra train cars had large orange seats with super soft cushion and high back so your bottom was comfortable and no one behind could possibly sneeze all over your neck. Then, they got new cars with cheap blue seats: hard as a rock cushions (if you can even all them that) and very short backrests that barely came up to my shoulders and I’m not that tall. There was no place to rest your head and sometimes you could feel the person behind you breathing. God forbid they sneeze! I started to wear hooded clothes and sit with my hood up just to have some sort of protection. But overall, the fellow commuters were quiet for the most part, and it was easy to tune out the annoyances with a good set of headphones. Or just by passing out for the entire train ride, which is what I did to and fro. My entire day depended on my train naptime, no nap and I was grumpy and crabby for the rest of the day. I haven’t been taking the train much recently. Maybe twice a year? Usually I go during the week because I have an appointment. Last Saturday, however, I was meeting a friend Downtown so I decided to just hop the train. I took the 10:37 am. It was a milk run, hitting every stop and took over an hour. And it was almost full when I got on it, and mine was only the third stop. I immediately grabbed the first available seat on the top level, the seats on top are single so you’re guaranteed some sort of privacy. The air was stuffy and smelly, they didn’t turn the AC on. And the noise was deafening. Is it a requirement to conduct conversations on the train by yelling? Or to board the train with screaming children even if you just parked your car that is perfectly capable of driving you to the city in peace and comfort? It was so loud that I could still hear everything even with my iPod blearing in my ears full volume. I realized that I should have reloaded with heavy metal playlist, my collection of Melody Gardot was not cutting through the insanity below. The JCrew girl – sitting across from me – attempted to do her Italian homework gave up after five minutes and slumped in her seat in despair. Probably counting days till her trip abroad where she could zip from country to country in comfort of Eurostar. And then there were the visuals… There were ample cleavages, with two sets of tan implants (that would explain the large group of youths squeezed into a couple seats behind me, from their point they could ogle without being punched in the face by the cleavage’s partner); a man with a case of beer – bottles – that he held on to for dear life the entire ride; a large man with an enormous belly wearing red/blue/and white diamond pattern shorts; a buttoned-up woman in an itchy sweater with a Lunchable that she carefully balanced on her palm as she built tiny cracker and ham sandwiches only to finish them off with a large can of Red Bull; and, this takes the cake, a woman with a hammer in her bag. 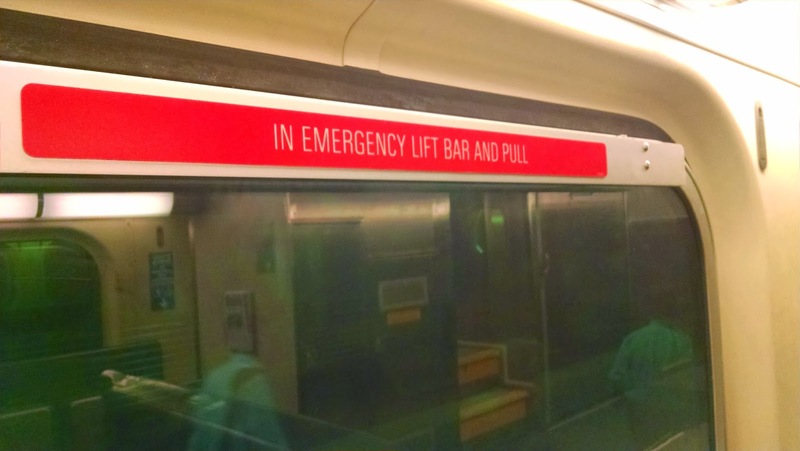 At one point I looked up at my window and noticed a large red bar across the top that said “In Emergency Lift Bar and Pull.” I wondered, does a Saturday morning migraine-inducing ride qualify as an emergency, or should I save this for my return trip? There was a fine bottle of Pinot Noir waiting for me at my friend’s house. And a ride home in a Jag.